Government: some see it as Communist, others as "Lao-style Socialism"
Thailand and Laos have a heritage of warm hospitality. You are made welcome visiting the cities and towns, and traveling into the forests, mountains and jungles, visiting ethnic groups and hill tribes. The further you go into the more remote areas, the more simple the life, based on family, agriculture and crafts. Thailand is different from its neighbors in that it has never been colonized and the people have a real sense of independence. Bangkok, the capital city, has welcomed travelers for decades, and offers a myriad of hotels and restaurants for every budget. The pace is fast, the traffic likewise. The farther from the city you go, the slower the pace. The pace in Laos is the most languid of southeast Asian countries, as it is only just beginning to be discovered by tourism. No throngs of motorbikes, hawkers and street vendors. The capital of Vientiane and the UNESCO World Heritage Site of Luang Prabang are becoming more sophisticated, with boutique hotels, chic restaurants and shops, though still filled with beautiful wats (temples) and saffron-robed monks strolling the streets. Appreciate the slower pace before it disappears! Laos has been affected by their neighboring countries of Vietnam and Thailand, as well as being absorbed by the French into French Indochina (Laos, Cambodia & Vietnam). The architecture and cuisine still mirrors that today. As anywhere in the world, be careful with your belongings. Do not wear or carry valuables. Keep your money in a hidden money belt, with only small amounts in your pocket. Always lock your hotel room door. From backpacker hostels to 5* hotels, you can find accommodation to fit your budget. There are some lovely places to stay on Thai islands, as well as the inland areas of both Thailand and Laos. Homestays can be arranged, if desired. Vegetarians are easily pleased here, as there is an abundance of fruits, vegetables and spices; almost any dish can be prepared vegetarian-style. You'll see many unusual (to the western eye) and tasty fruits, such as rambutan, jackfruit, salak and tamarind – be sure to try them. Thai food is hot! But you can request milder versions of whatever dish you order. Here, too, rice is ever-present. You may see peanuts included in some dishes, so beware if you have an allergy. No chopsticks here, only a spoon and fork. The fork is used to move food into the spoon. At street noodle stalls, you may see noodle soup being eaten with chopsticks and a spoon. In tourist centers, McDonalds, Pizza Hut, etc. can be found. If a dish is too hot, avoid downing a glass of water, which doesn't help – instead swallow a teaspoon of sugar, or a banana. Laotian food is delicious, with rice as the staple, always freshly-prepared and served with various sauces. Black sticky rice is served in charming small baskets; use your fingers to take out a small amount to eat with your food. The word "ping" designates barbecue. "Laap" is the national dish, translating to "chopped meat". Because of the privations suffered during the Communist regime, when hunger was wide-spread, the Lao people ate everything – some items not so palatable to western tastes. When in the remote areas, if this concerns you, ask what is in the dish being offered. Don't pile food on your plates from communally-served dishes; take a bit from a dish, eat it and then take another. It is courteous to leave a bit of food on your plate and the serving plate to demonstrate the generosity of the host. Bottled water only. Do not take any risks. And use it to brush your teeth. Hard liquor may be found at larger hotels and restaurants in tourist areas. Beerlao is excellent, and the Thai Singha beer is also good. Wine is expensive, and found, again, at the upscale hotels and restaurants. IF credit cards are accepted, they will be Visa and Mastercard. Lao currency is called "kip". Laos has very few ATMs, so don't rely on them. Vientiane has a few. Bring enough cash to pay your bills and purchases. Thai bahts sometimes accepted. The Thai currency is the "baht". Thailand's larger cities will have several ATMs. Visa and Mastercard are widely accepted in some shops, more upscale hotels and restaurants, but always have some local cash on hand, just in case. The U.S. dollar is widely accepted, as well as Euros. Laos does not have good, reliable healthcare facilities – the closest are in northern Thailand. It is difficult to find reliable medical care in rural areas. Talk to your guide and/or hotel for assistance. There are English speaking doctors in Bangkok, which your Embassy can recommend. Otherwise, go to the outpatient department of a private hospital with acceptable standards – ask your guide or hotel. However, the further afield you go, the less you will find adequate facilities. PURCHASE TRAVEL INSURANCE FOR MEDICAL, EMERGENCY EVACUATION AND TRIP CANCELLATION. Your US insurance may not cover out of country expenses – check before you leave. Medicare does not. Thailand also is known for its weaving, especially from the northeast areas. Handcrafts are best purchased upcountry. Thai silk is famous the world over and a wide selection can be found in Bangkok, particularly at the Jim Thompson House, a marvelous museum and shop. Bangkok is also a good place to buy jewelry, though do your homework before leaving home. There are many cases of bad authentications and rip-offs. Ask the Embassy and your hotel for reliable shops. 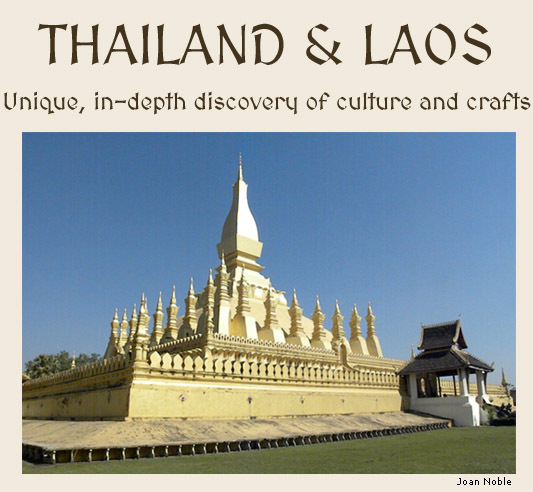 Laos is renowned for its silk and cotton weavings and beautiful scarves and shawls can be found at good prices. Mass production has not yet reached the country, but in larger towns, be sure to look for "made in China" tags. There are also beautiful bamboo woven baskets, silver jewelry and wood carvings. Vientiane and Luang Prabang have many excellent shops. Noble Journeys would be pleased to assist you in planning your trip to these marvelous and unique countries.